The spinal column is of simple construction, yet performs a vital role in our body’s inner workings. The first thing it allows is for us to move our torso around in an almost circular motion as well as simply bending forwards and backwards and twisting from side to side. It also houses the spinal cord, which runs through holes in each of the vertebrae that compose the spinal column and protect this spinal cord. The spinal cord relays messages from the brain to the rest of the body for muscle movement and touch and feel sensations. Between each of the 33 vertebrae is a small disc made largely of cartilage that over time can suffer great degradation leading to your back becoming immensely painful. Often surgery is needed to correct this, and one of the surgeries performed for this is spinal fusion surgery. In the case of a vertebral disc that is too damaged to repair, a vertebra that has been fractured, if there is a deformity (like spinal curve) that needs correction or a treatment of some cervical disc herniation, it might sometimes be necessary to do a spinal fusion surgery. Spinal fusion therapy at its base involves grafting a bone graft between two vertebrae. Ultimately, the aim of a spinal fusion is to create a solid union between two (or more) vertebrae. This can involve the use of plates, screws and cages, usually used as an internal split while the bone graft heals. 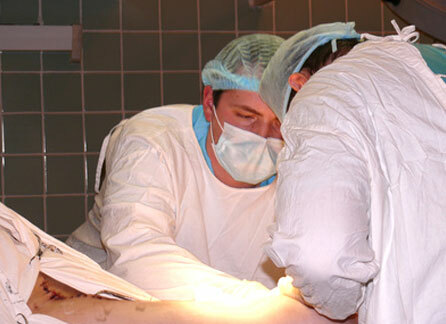 Depending on which vertebrae are being fused, the surgeon may operate from either the posterior (from the back), anterior (from the front) or a combination of both. The surgeon will use an open dissection to make the spine viewable by making a long incision and dissecting the muscle from the spinal column. From here they will start by positioning a bone graft. The bone can be from various sources - An auto graft is bone harvested from the patient’s hip, allograft used from a cadaver or sometimes, manufactured synthetic material is used. In either case, bone is connected to both vertebrae and, using screws plates and cages secured in place, this allows the bone to naturally fuse to the vertebrae. This hardware is not always used, but more often than not it is. If you require spinal fusion surgery, you can get it using your National Health Service, as they fully support and recommend the surgery in cases where there are no other alternatives. Often the surgeon will offer alternatives as spinal fusion surgery is becoming less popular these days, especially with the ever increasing popularity of using an artificial disc. In some cases, like scoliosis, this is not possible and spinal fusion therapy will be the only surgery available to you. If you do not qualify for the NHS surgery, whatever the reason, consult with a surgeon who will review your specific case and provide you with costs that will be involved in performing this surgery.